An Ordinance to amend the Prevention of Cruelty to Animals Act, 1960 so as to preserve the cultural heritage of the State of Tamil Nadu and to ensure the survival and wellbeing of the Native breed of bulls. 1. (1) This Ordinance may be called the Prevention of Cruelty to Animals (Tamil Nadu Amendment) Ordinance, 2017. "(dd) "Jallikattu" means an event involving bulls conducted with a view to follow tradition and culture on such days from the months of January to May of a calendar year and in such places, as may be notified by the State Government, and includes "manjuviratu", "vadamadu" and erudhuvidumvizha." "(2) Notwithstanding anything contained in sub-section (1), conduct of "Jallikattu', subject to such rules and regulations as may be framed by the State Government, shall be permitted." "(f) the conduct of 'Jallikattu' with a view to follow and promote tradition and culture and ensure preservation of native breed of bulls as also their safety, security and wellbeing." "Provided that nothing contained in this section shall apply to conduct of "Jallikattu". (c) the conduct of Jallikattu' with a view to follow and promote tradition and culture and ensure survival and continuance of native breeds of bulls." 28-A, Saving in respect of Jallikattu - Nothing contained in this Act shal apply to 'Jallikattu' conducted to follow and promote tradition and culture and such conduct of Jallikattu shall not be an offence under this Act." The Prevention of Cruelty to Animals Act, 1960 (Central Act 59 of 1960) was enacted to prevent the infliction of unnecessary cruelty and suffering on animals. The Act also recognises the need to exempt the application of its provisions in certain circumstances. The Supreme Court of India, in its judgment in Animal Welfare Board of India Vs. A Nagaraja (Civil Appeal No. 5387 of 2014) has found that the conduct of Jallikattu' is violative of the provisions of the Central Act 59 of 1960, particularly, sections 3, 11 and 22 of that Act. Considering the vital role played by the event of 'Jallikattu' in preserving and promoting tradition and culture among people in large parts of the State of Tamil Nadu and also considering the vital role of 'Jallikattu' in ensuring survival and continuance of native breeds of bulls, the Government of Tamil Nadu have decided to exempt the conduct of 'Jallikattu' from the provisions of the said Central Act 59 of 1960. Accordingly, the Government have decided to amend the said central Act 59 of 1960 in its application to the State of Tamil Nadu. Secretary to Government-in-charge Law Department. The Tamil Nadu specific ordinance to the Prevention of Cruelty to Animals Act of 1960 provides an exemption to jallikattu by bypassing the provision in the parent law that deals with restrictions on 'performing animals'. Called the Prevention of Cruelty to Animals (Tamil Nadu Amendment) Ordinance 2017, the new law has amended Section 22 (restriction on exhibition and training of performing animals), by stating that "nothing in this section shall apply to the conduct of jallikattu." There have been persistent demands from various quarters that bulls, which were included in this list through a notification of the Ministry of Environment and Forests in July 2011, be removed from the list. After the Supreme Court gave its verdict against jallikattu in May 2014, the Centre, through an executive order in January 2016, sought to provide an exemption for the conduct of the event. But the court stayed the operation of the executive order. Four other Sections have been amended and one new Section, called 28A, has been added. They are: Sections 2 (definitions), 3 (duties of persons having charge of animals), 11 (treating animals cruelly), and 27 (exemptions). The new Section will be known as 'saving in respect of jallikattu', which comes under the chapter of 'miscellaneous'. The text of the ordinance, which was promulgated on Saturday and kept virtually confidential, was provided to The Hindu on Monday morning. The Explanatory Statement of the ordinance refers to the Supreme Court's judgment of May 2014, which had held that the conduct of jallikattu violated the provisions of the 1960 law, especially Sections 3, 11 and 22. The State government had decided to give the exemption, "considering the vital role played by the event of jallikattu in preserving and promoting tradition and culture among people in large parts of the State of Tamil Nadu and also considering the vital role of jallikattu in ensuring survival and continuance of native breeds of bulls." The amendment to the Section 2 defines jallikattu as an event involving bulls conducted with a view of following tradition and culture on such days from the months of January to May of a calendar year and in such places, as may be notified by the State government. The term includes 'manjuviratu', 'vadamadu', and 'erudhuvidumvizha'. The Section 3 of the Principal Act has been renumbered as sub-section (1) of that section, after which the following has been added: "notwithstanding anything contained in sub-section (1), conduct of jallikattu, subject to such rules and regulations as may be framed by the State government, shall be permitted." As for the Section 11, another important provision of the parent law, the clause, called sub-section (f), has been included and it States that "the conduct of jallikattu with a view to follow[ing] and promot[ing] tradition and culture and ensure preservation of native breed of bulls as also their safety, security and wellbeing." In respect of Section 27, a clause, known as sub-section ( c ), has been added. It says, "the conduct of jallikattu with a view to follow[ing] and promot[ing] tradition and culture and ensure survival and continuance of native breeds of bulls." Section 28-A states "nothing contained in this Act shall apply to jallikattu conducted to follow and promote tradition and culture and such conduct of jallikattu shall not be an offence under this Act." Animal Welfare Board of India and animal rights activists have moved the Supreme Court challenging Tamil Nadu's amendments to PCA. The Animal Welfare Board of India (AWBI) and animal rights activists on Wednesday mentioned in the Supreme Court their challenge against the new jallikattu law passed unanimously by the Tamil Nadu Assembly. A battery of lawyers, led by senior advocates Abhishek Manu Singhvi and Anand Grover, appeared for the Board and the activists before a Bench led by Justice Dipak Misra. Justice Misra told the lawyers that the court would take up their petitions probably on Monday when he is sitting in a combination with Justice Rohinton Nariman. Both judges form the jallikattu Bench. The development comes a day after Attorney General Mukul Rohatgi informed the court that the government would file an interlocutory application seeking the withdrawal of the January 7, 2016 central notification allowing jallikattu in the light of the new Prevention of Cruelty (Tamil Nadu Amendment), 2017, passed by the Assembly. The court had agreed to hear the application. Justice Misra had told that he would hear the application with Justice Nariman. In all likelihood, both the animal rights activists challenge and the government's application would be heard on Monday. Almost 70 caveats have been filed by various parties, including the Tamil Nadu government, in the apex court in the past two days in anticipation of a challenge against the new pro jallikattu law of the State. However, when contacted, AWBI Chairman (Acting) told The Hindu that the organisation would not challenge the Tamil Nadu law. "I don't know about other organisations, but the AWBI won't be filing any petition..We also don't intend to do so in the future," said SS Negi, who is also Special Secretary (Forest) in the Environment Ministry. The AWBI advises the government on proper implementation of the Prevention of Cruelty to Animals Act. When the AWBI originally led the challenge, it was led by RM Kharb, who has since retired. Dr. Negi didn't immediately explain how the AWBI is still a party to Tuesday's challenge. Why was an ordinance promulgated by the Tamil Nadu government to facilitate the conduct of jallikattu in Tamil Nadu? Jallikattu was under a judicial ban in Tamil Nadu following the Supreme Court's verdict in May 2014. An amendment to the relevant law, the Prevention of Cruelty to Animals Act, 1960, was needed to remove the basis on which the judgment was passed. As the Assembly was not in session and a volatile atmosphere prevailed in the State because of the strident demand for legal protection to the conduct of jallikattu, the State government promulgated an ordinance. Why did the Union government not amend the Act for the same purpose? The Union government is currently defending a January 2016 notification it had issued to enable the conduct of jallikattu, subject to some regulations, despite bulls being barred from use as performing animals under the PCA. The Supreme Court has reserved its judgment on the validity of the notification. As the matter was sub judice, the Centre did not want to promulgate an ordinance for the same purpose. What is the legal status of the ordinance? The ordinance is a 'State amendment' to the Central Act. This means that in its application to Tamil Nadu, some provisions will be different from what they are for the rest of the country. PCA falls under Entry 17 (Prevention of Cruelty to Animals) in the Concurrent List of the Constitution. This means both the Centre and the States have concurrent power to enact laws on the subject. Subject to some restrictions and a prescribed procedure, State governments may amend central laws or have their own laws on the same subject in which the Union government has its own law. This may be done by the Legislative Assembly in its usual course or it may be promulgated as an ordinance if circumstances warrant such recourse. What was the procedure adopted by the Tamil Nadu government to bring this ordinance? This ordinance to amend the PCA was brought after prior 'instructions' from the President under Article 213 of the Constitution. The draft of the ordinance was sent to the Union government, which examined it and gave its consent on behalf of the President to its promulgation by the Governor. Why is the President's prior approval necessary? This is necessary because the Constitution says that where there is 'repugnancy' or 'conflict' between a Central law and a State law, the provisions of the Central law will prevail. However, if the State law obtains the President's assent, it will prevail over the Central law. What are the key aspects of the ordinance? 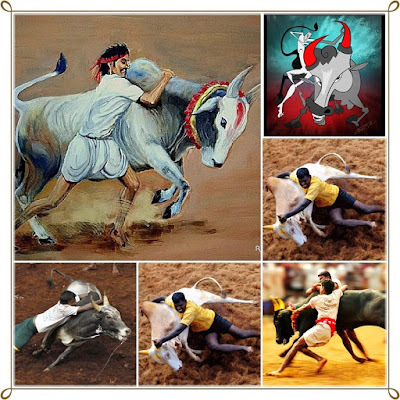 a) It defines 'jallikattu' as an event involving bulls conducted with a view to following tradition and culture between January and May every year in Tamil Nadu, and which includes 'manju virattu', 'vadamadu' and 'eruthu vidum vizha'. b) It amends Section 3 of PCA so that notwithstanding its provisions, jallikattu may be held subject to rules and regulations. c) It amends Section 11 to add 'the conduct of jallikattu' as another exception to the list of actions that do not amount to cruelty. d) It amends Section 22, which relates to restrictions on some animals being used for performances, to make this clause inapplicable to jallikattu. e) It adds jallikattu as another item in a list of 'exemptions' from the rule against using some animals as performing animals. The original list contained use of animals by the police and military after training them and for use for scientific and educational purposes. f) It adds Section 28A to say nothing in the Act would apply to jallikattu. How does the ordinance seek to undo the effect of the Supreme Court judgment? The ordinance seeks to address the specific grounds on which the Supreme Court held jallikattu illegal. In particular, the court had held jallikattu to be violative of Sections 3, 11 and 22 of the PCA. So, the new law amends or adds to the relevant sections. In addition, it seeks to overcome the objection that the State law is not in conformity with the relevant central law. An earlier Act, , the Tamil Nadu Jallikattu Regulation Act, 2009 was struck down by the Supreme Court on this ground. The present ordinance seeks to eliminate the elements of conflict with the Centre's prior permission. Is the ordinance enough to safeguard jallikattu events from a future ban? In the event of a legal challenge, this new law is also subject to judicial review. In particular, it may be questioned on the ground a) that jallikattu is inherently cruel and cannot be given an exemption from the PCA b) that it violates animal rights and dignity and c) it is contrary to the Fundamental Duties enjoined by the Constitution and fundamental freedoms that animals are entitled to enjoy under international principles laid down by the World Health Organisation for Animals. Is the ordinance a permanent solution or a temporary fix? There is a wrong impression that the ordinance is not a permanent solution. Any ordinance comes into effect immediately. It has to be laid before the legislature within six weeks of the legislature being convened. As the Tamil Nadu Assembly is in session from today and is expected to pass a Bill to replace the Ordinance, the question of its longevity is irrelevant. Unless stayed, suspended or set aside by a court of law, this law will prevail in Tamil Nadu.